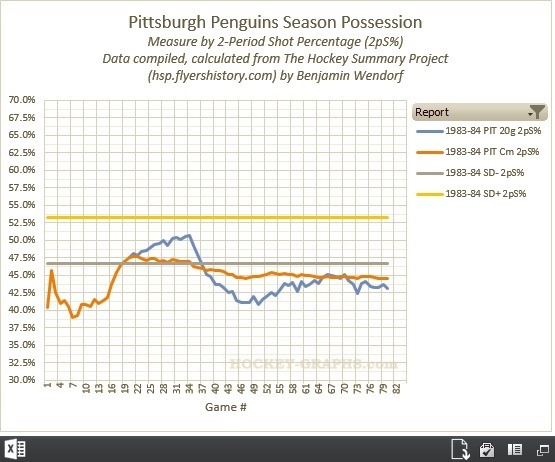 And just what do your rough offense and defense measures look like when you tank this badly? If you guessed “the gaping maw of a fail dragon,” you’d be correct. They weren’t much defensively even before they decided to tank, but there was definitely some semblance of offense that was utterly destroyed by the dismantling of their top defensive pair. Legitimate health concerns for top forward Rick Kehoe shut him down early as well (he would retire the following season when persistent circulatory issues arising from a pinched nerve proved too much). Possibly the only guy who seemed to be trying was poor Mike Bullard, a bit of a forgotten sniper of the 1980s who managed 51 goals (a career high) despite a team falling apart around him. He’s probably a big reason why the shooting percentage line is the only one that clings to, rather than falls off, the cliff. There’s just no discernible tank trend in there for the 2003-04 squad; they simply sucked. Nobody, save the Italian Men’s National Team, would play Rico Fata 18 minutes per game ever again. 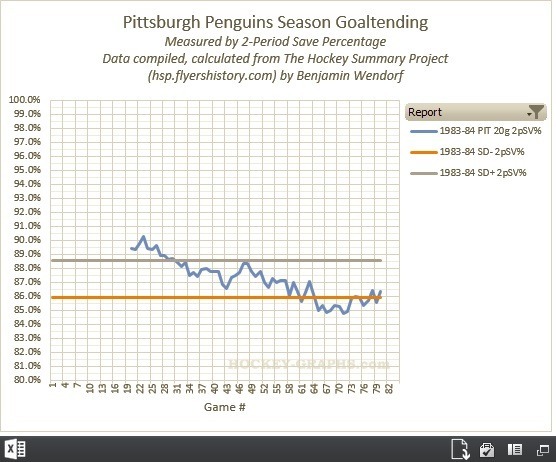 They might get a lot of flak for playing so poorly, and it’s probably easier to not look like you’re tanking if you’re already bad (see the Rico Fata-led Penguins above), but they have played slightly better than the beginning of the season. 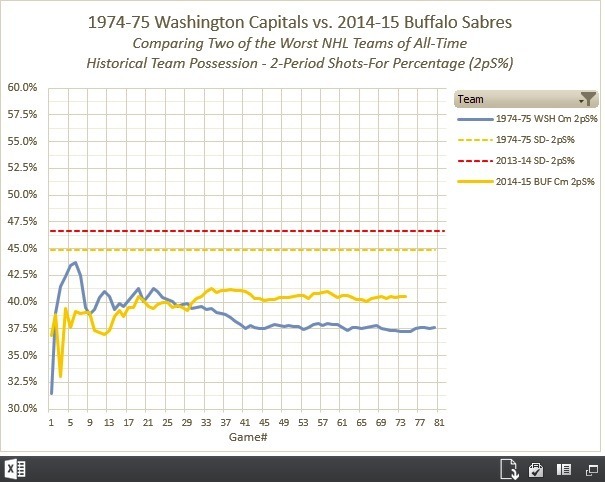 Whether it’s trading players for picks or assets to-be-named, or sending down talent, or yelling at coaches with 2-goal 1st period leads, there’s an art to tanking in spectacular fashion, and the data is no different. 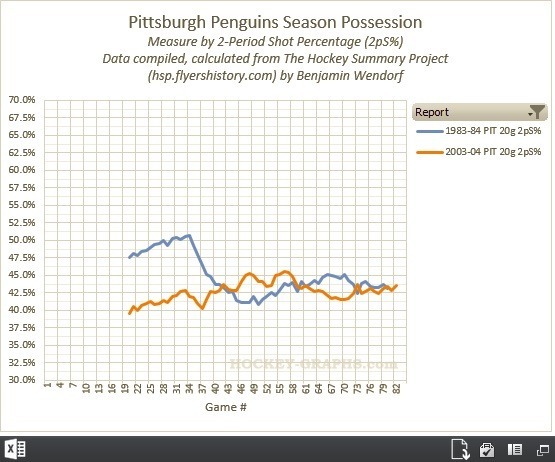 It’s some truly impressive acrobatics to see a team drop two standard deviations in possession, and with visualizations like the ones above we can better pinpoint just what kinds of things caused it to happen. Here’s looking forward to when we can place the Leafs, Coyotes, and Oilers under the same microscope. 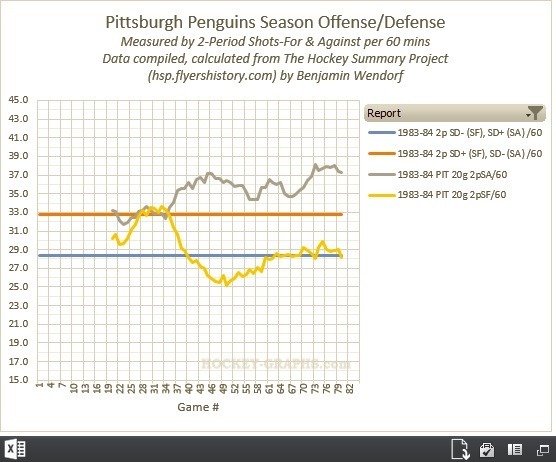 Note: I’ve since put together another post showing the Penguins’ and Devils’ 1983-84 measures alongside one another to help demonstrate the battle itself; check it out here. 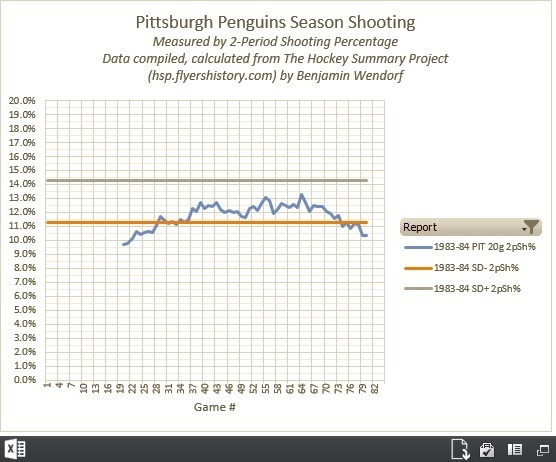 ← Hockey Graphs Podcast Episode 11: Playoffs?